Green Quilts Update April,98. Turtle Moon Studios. Michele Merges Martens, our hardworking desktop publisher, of Watervliet, NY, poses with some of her new works in progress, at the Art Quilt Network meeting in Columbus, Ohio, in April. The large triangular piece is "heaven" in progress, which goes with the poem below. I was really glad to be able to be with Michele during the Art Quilt Network meeting this month, and catch up, not only on GREEN QUILTS planning, but also on our friendship. Both of us are very busy, and email now and then. But this was our first reunion in a year. Michele just got a promotion at work! She is now the manager in Management & Technology Enrollment Systems, at the Lally School of Management & Technology, at Rensselaer Polytechnic Institute of Troy, NY. She's also a busy mother, wife, poet, and art quilter. Her in-progress Lilith Cloak was too bulky to bring along to Columbus, but many of her new quilts came along. She also self published and brought a small volume of her poems! Michele's mother is very ill, and Michele will now be spending a lot of time with her. This involves very long weekend trips. Please send her your thoughts and prayers. Here is the poem Michele wrote, which goes with the triangular work in progress above, both of which are called "heaven:"
what's my idea of heaven? well, my religion says heaven's where God is. i'm not there yet, and i've never seen God. i don't think He'd pay much attention to me, anyways. and live simultaneously all of those alternate lives. but with no lost memories. i asked my son what heaven would be. with hundreds of lit candles. i can't believe in heaven unless it has colors in it. heaven could be that odd door that opens both ways. that you'll never recognize them. you go, i am left here. this creates an ever-widening triangle. 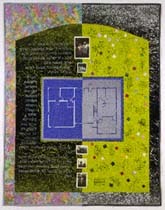 Below right: "Sammy and Rosie Get Laid to Rest - A GREEN QUILT." © 1997 Robin Schwalb . Brooklyn, NY. 75"h x 59"w. Photo silk screen, stencil, overdyed and commercial fabrics, xeroxed transfers. Machine pieced, hand appliqued, hand quilted. Photo by Karen Bell. Meanwhile, we find our tireless label artist Robin Schwalb officially turning in her first registered GREEN QUILT! (She has told me of several earlier pieces that she considers to be GQ's, but has she sent or given me slides? I think not!) Points are noted in the book for sending slides and a full statement about this piece! Seriously, this piece is truly a healing quilt, made by Robin in memorium to her parents and to the longtime family home and the beautifully landscaped yard and garden there. All the plants Robin remembers in the yard are recorded by their common names, in her mother's handwriting, and the quilt includes the Hebrew text Kaddish, the prayer for the dead. The photographs are members of the family in the yard, and the blueprint is of the house. Not long after the sale of the house to settle her parents' estate, the new owners bulldozed the yard, so this piece is Robin's way of holding onto her memories. "Walking Away." © 1998 Bonnie Peterson, Elmhurst, IL. 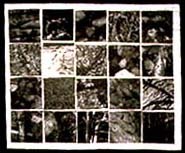 27"h x 33"w. Photocopy transfers on cotton, quilted. "I am looking at pattern and texture which I find on the trail...I looked at the large domes, granite walls, waterfalls, pine needles, bare branches, and footprints on the earth." Bonnie Peterson sent me slides (AND statements!) 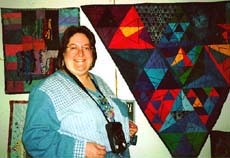 of her quilts based on her 1997 experience in Yosemite National Park. She also sent a slide to Sally Scott in South Africa, as requested in last month's update. I bet she also sent the slides and statements to Robin, for the NYC GQ Registry! Hey, maybe this online stuff for GREEN QUILTS is going to help the project a lot! Yippee!